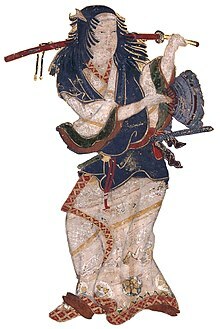 Okuni (出雲の阿国, Izumo no Okuni, born about 1572) was a Japanese woman from the warring states period (15th to 16th century) who began the Japanese entertainment called kabuki. Her name means "Okuni from Izumo". Her performing arts evolved from traditional dancing. Okuni founded kabuki. She is from Izumo Taisha shrine in the late 16th century. She was a daughter of Sanemon Nakamura but it is not sure when she was born and died. She started to dance Kagura-mai and Nenbutsu-odori (two traditional dances) in kimono in order to gather money for repairing Izumo Taisha. Although dance was holy at that time, Okuni went on stage in the highest fashion. She inserted a song and character of ghost on stage. It became popular because it was unique. At first Okuni danced simple dances. Later, she danced with clothing of a man, and showed at the Kitano Tenmangutemple in 1603. This became the first kabuki. Okuni's troupe was exclusively female. Thus, she required her actresses to play both male and female roles. In particular, Okuni herself was best known for her roles as samurai and Christian priests. As her group gained fame, she was copied by many others, particularly brothels. They offered such shows to amuse wealthy clients, and get prostitutes who had marketable acting and singing skills. This new style of exclusively female groups became known as shibai, onnakabuki, (from onna, the Japanese word for "woman" or "girl") and Okuni kabuki. In 1629, due to public outcry for moral reform, those under the shogun Tokugawa Iemitsu forbade women from performing in kabuki. Wikimedia Commons has media related to Izumo no Okuni. ↑ 2.0 2.1 "出雲の阿国歌舞伎の始祖". Retrieved 2 February 2015. ↑ Okuni, in Japan Encyclopedia. Louis Frédéric (ed) transl. Käthe Roth. Harvard University Press. This page was last changed on 19 August 2017, at 12:52.